A double-tub wringer washer, a bucket for a milking machine and a pan from a salad bar are some of the items that have been found new uses in the garden of Terry and Debbie Calway on Hampton Parkway in Tonawanda. The Calways’ garden was among the more than 50 gardens open to visitors during the Ken-Ton Garden Tour on July 21 and 22. In the photo at left, a huge coffee machine on the Calways’ front porch becomes a pedestal for annuals. 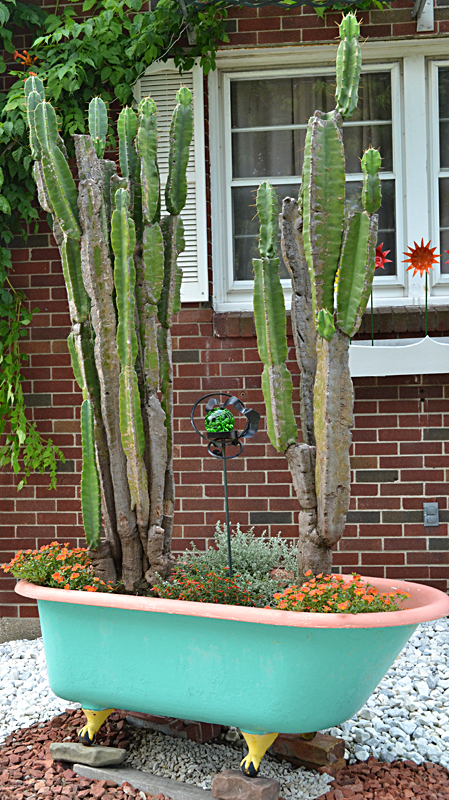 A must-see feature is the nine-foot-tall Peruvian apple cactus plants in the multi-colored bathtub, which you can see below.The tub has a drain and other holes that keep the cactus plants from getting too much water. The plant on the left was only about an inch tall when Terry’s mother received it as a gift in 1955– The plant is older than Terry is. The plant on the right grew from a piece that broke off the original plant decades ago. The Calways bring in the cactuses each winter and take them outside again in mid-May. The plants are tall and heavy– the larger one weighs about 200 pounds– so they lop as much as three feet off the tops to make the plants easier to move. Lucky friends get the pieces they cut off. In early October 2006, the older cactus began to flower for the first time. The Calways don’t bring the cactuses in until just before Halloween, so there should have been plenty of time to see the blossom unfold. Unfortunately, on Oct. 12 the October Storm hit and killed the flower. The cactus hasn’t flowered again. But the plants do grow well. The couple has another cactus on the side of the house that grew a foot in about two months. Terry has a friend who was given a cactus plant by Terry’s mother when the boys were teenagers. The friend doesn’t trim his cactus plant. It grew as high as the ceiling, and when it ran out of room, it turned and began to grow horizontally. He put hooks in the ceiling to help support it as it trails across. Many found objects are used in the front lawn, as you can see below. 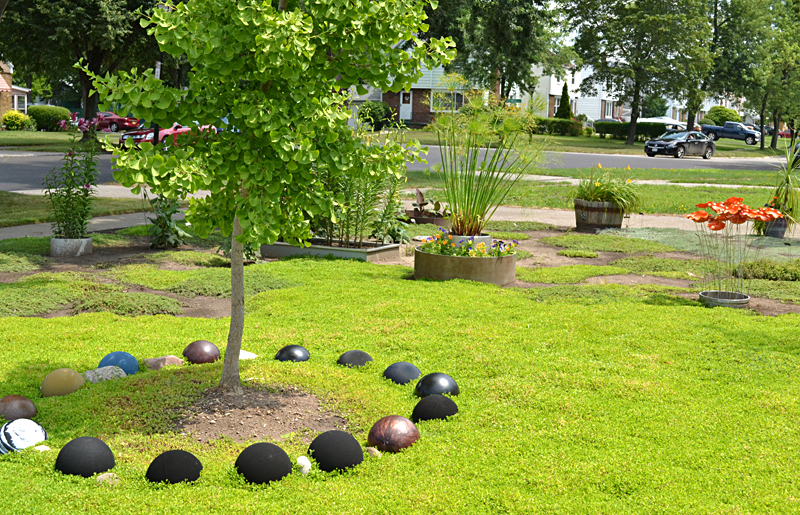 A ring of bowling balls surrounds the ginko tree. They started out with a ring of rocks and four bowling balls. When their mail carrier noticed they were using the bowling balls, if she saw a bowling ball set at the curb for the garbage, she would leave it for them under their mailbox. Even strangers have left bowling balls for them. Every time they get a new bowling ball, they take out a rock and replace it with the ball. Tip: Place the bowling balls with the thumb-hole down. Terry thinks some of the balls might have cracked because the holes were facing up. Beyond the ring of bowling balls, you can see a couple of container plantings. 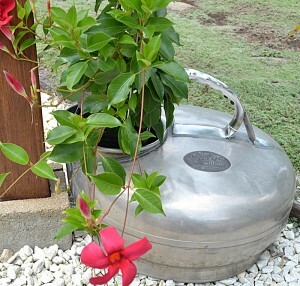 The round planter is made of pieces of large pipe. The square one is a pan from an old salad bar. Terry made the orange steel poppies to the right of the planters. You might not have noticed, but that’s a grassless front lawn. It’s covered in different kinds of groundcovers. ‘Crystal River’ Speedwell seems to hold up the best, Debbie said. They also have Veronica peduncularis (creeping speedwell), Mazus reptans ‘Purple’ and a succulent called Sedum acre ‘Aureum’. 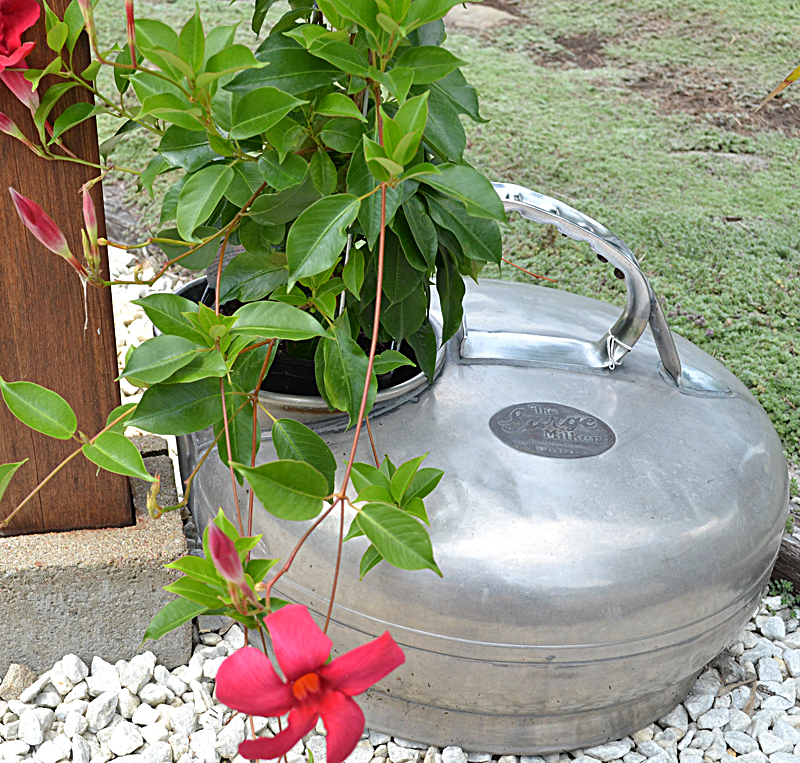 Above, a stainless steel bucket for an old milking machine holds a clematis. 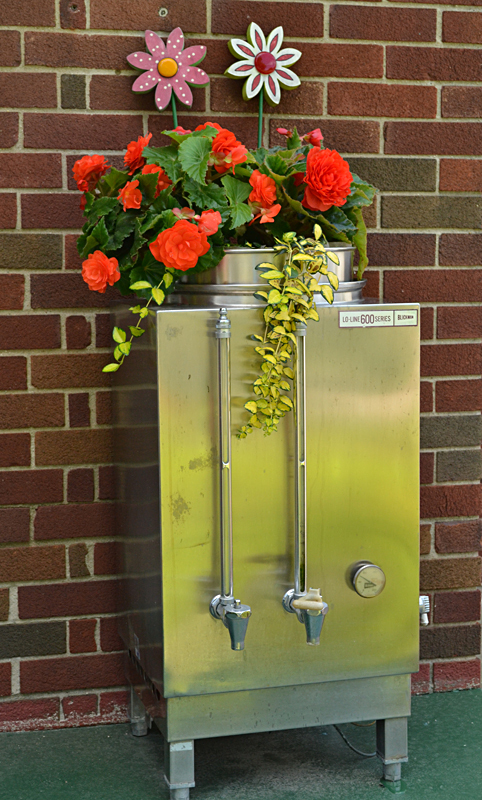 Below, a double-tub wringer washer on the porch has been converted into a container garden. 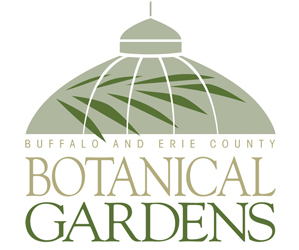 Coming up this weekend is Garden Walk Buffalo, the largest garden walk in the entire United States. It will take place from 10 a.m. to 4 p.m. Saturday and Sunday, July 27 and 28. Five free shuttle buses will be available to take you from one section of the walk to another. Garden Walk Buffalo maps are available online. You can also pick up maps at three headquarters: Richmond-Summer Senior Center, corner of Richmond Avenue and Summer Street; Buffalo Seminary, 205 Bidwell Parkway near Soldiers Circle and Chapin Parkway, and Evergreen Health Services, 206 South Elmwood Avenue, corner of Chippewa Street, all in Buffalo. The Peace Bridge, Iskalo’s Electric Tower and the M&T Bank building downtown in Buffalo will be lit up green during Garden Walk weekend. I loved the grassless lawn! How long did it take to fill in and does it require a lot of water? Thanks for your comment on the “grassless” lawn. We’re currently on our 4th summer after removing all the grass. Watering is variable. If we’ve not had rain for a few days, then I will let the sprinkler run. Hopefully the bare earth patches that still remain will fill in within the next couple of years. 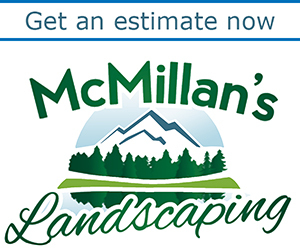 Are your groundcovers “stepables “? Where did you purchase them? We also have no grass but use mulch which gets expensive. The groundcovers I planted didn’t hold up to foot traffic. We were also on the walk. 156 Knowlton. The ‘lawn’ substitutes are a really interesting and pretty solution. We have a grassless lawn also. Creeping thyme is the best ground cover we have found. It spreads quickly, rarely needs watering makes lovely flowers in late spring and smells terrific when disturbed. Yes, I’m looking forward to the Black Rock-Riverside Tour. It’s on our Upcoming Events Page. That will be the last of the garden walks for this year. Boy, this summer is going by so fast. I love the article!!! This couple inspires me so much. Their original ideas and artsy taste has resulted in one of my favorite houses I have ever been to! I’m so glad Grandma was mentioned in the article when talking about the cactus! Wish I could be there for the garden tour! Another one of my favorites is what my Uncle Terry does with cobalt glass bottles ( I believe in the back yard) so don’t forget to check that lawn sculpture out also! When I was very young, in kindergarten or younger, my mother had a wringer washer and we kids would want to help. It was so cool to see the clothes go in with an amorphous shape and come out flat. Of course, we were too young to be of any real help, so it was less fun for our mother who was constantly afraid we would get our fingers caught in the wringers. I had a similar growing up experience with a wringer washer, Connie. Lucky for me, by the time I was old enough to really help with the laundry, my mother bought a modern machine. 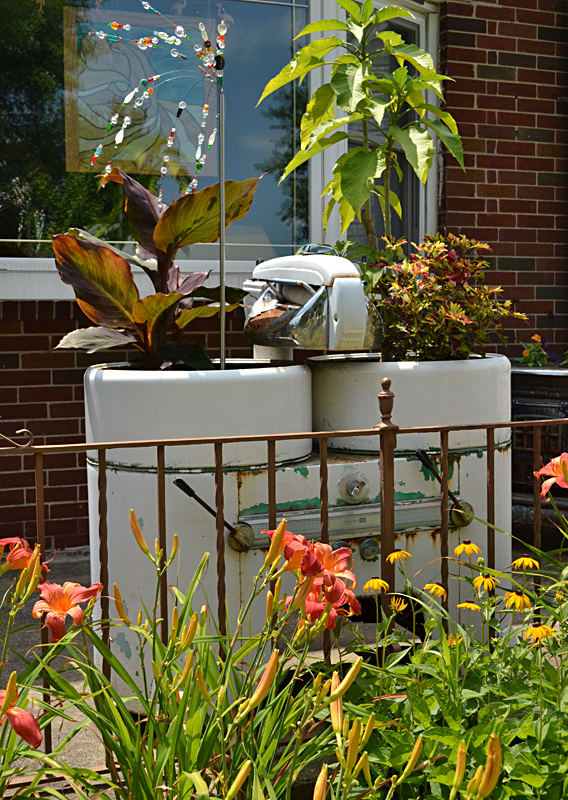 The Calways have used their garden to inspire nostalgia in the garden! 2 of the 3 groundcovers that we have used are “Stepables.” They are ‘Aureum’ Sedum acre and ‘Purple’ Mazus reptans. The ‘Purple’ spreads fast, but is not very deeply rooted, and doesn’t do well in drought. The best of the 3 groundcovers is Carpet Speedwell (Veronica Crystal River), but I can’t seem to find it anymore. I’d love to buy more so that I can fill in the bare patches with it. It is deeper rooted and holds up to drought. The cactus are brought out in May and taken indoors mid to late October. The tub stays outside. The last 2 two years my husband and I have had to rely on the (very strong) son of a friend to help us with the cactus as they are HEAVY! Thank you, Deb, for the ground cover information. As for not being able to buy more Carpet Speedwell, you may be able to propagate your own. Take a sprig, dip it in rooting powder and sick it in the ground in a hole made with a pencil or something similar in size. Firm the soil and keep watered until it takes hold. You may be surprised and save a lot of money. Hi! Love the article! I also have steppables instead of lawn. We picked two varieties. Blue Star Creeper & Creeping Bronze Fern. In summer Blue Star is the showy plant. It carpets the lawn w/ blue flowers. In the spring&fall Bronze Fern quietly works it’s magic. Strangely Blue Star stops flowering during our BlackRock Riverside Gardenwalk. Thanks for your tip on how I can propagate more of the Carpet Speedwell. I’m definitely going to try that!